Chronic kidney disease, palliative care, qualitative research methods, mixed methods, end of life care. As a Senior Lecturer I have made a substantial contribution to improving the care offered to patients with end-stage kidney disease approaching the end of life as evidenced by my publications in leading international journals and my leadership of several research studies including a successful multi-institutional study funded by NIHR. I have a consistent record of publishing peer reviewed publications in the top quartile of impact factored journals in my field. I was successfully returned at REF 2014 and on target to be returned in 2020, as assessed by the School of Nursing and Midwifery REF 2020 review Group. I have a sustained record of leading, and managing to successful completion, a coherent programme of research including successful research bids. Over the past four years, I have exceeded my School’s targets for research funding, bringing into QUB over £560,000 in research income. As evidence of my significant contribution to QUB’s international profile in research, I am Scientific Programme Committee member of the European Dialysis and Transplant Nursing Association annual conference (previous Chair) and commence a new post as their Chair of the newly established Renal Research Group. In addition I am Associate Editor of Evidence Based Nursing, Associate Editor BMC Nephrology and was previous Editor and English Co-Editor of the Journal of Renal Care. I regularly receive funded invitations to speak at international Conferences, most recently in Sydney Australia at the Renal Society of Australasia in 2017 as International Keynote Speaker. I have received several awards for my work including ‘Eminent Scientist of the year 2009’, an International Award in the field of Nephrology, by the World Scientists Forum; the City University Staff Research Prize, 2009 and the Student Representative Award, City University London, 2010. In 2016 I received the Renal Association Walls Bursary, made by the professional body for nephrologists and renal scientists in the UK, “acknowledging Dr Noble’s significant contribution to the field of academic Nephrology”. I am a Fellow of the Chronic Illness and Palliative Care Research Programme at the Centre for Evidence and Social Innovation at QUB. I have published widely in research and clinical journals including seminal papers identifying the need for a supportive and palliative care approach for people with end-stage kidney disease. My ‘Concept Analysis’ published in 2007 determined Renal Supportive Care as a dynamic and emerging concept with relevance for the renal community, and I recommended its integration into everyday nephrology practice. One of my papers was the top downloaded article in EBN 2015, with over 26,000 downloads. 'Issues of validity & reliability' http://ebn.bmj.com/content/18/2/34.full and is part of the Research Made Simple series. · Grant Reviewer for The NIHR Evaluation, Trials and Studies Coordinating Centre (NETSCC), based at the University of Southampton which manages evaluation research programmes and activities for the NIHR. Noble, H (Chief Investigator) Fogarty, D, Shields, J. Crowe, L and Brown, J (2012-2013). Exploring renal deaths in Northern Ireland and the views of carers. GAIN funding. Thomas, N. Jones, J. Noble, H. Chamney, M (2011-2102) Establishing a Patient and Carer Advisory Group for the Kidney Research and Education Initiative. British Kidney Patient Association. Kelly, D, Reid, J, Noble, H (2018-) (Co-investigator) Strengthening the future role of Executive Nurse Directors: a UK study. Noble, H Matthews, M (2017-2018) A Pilot Study to Examine Perceived Benefits of Reflexology Undergoing Hospital Based Haemodialysis (PI). 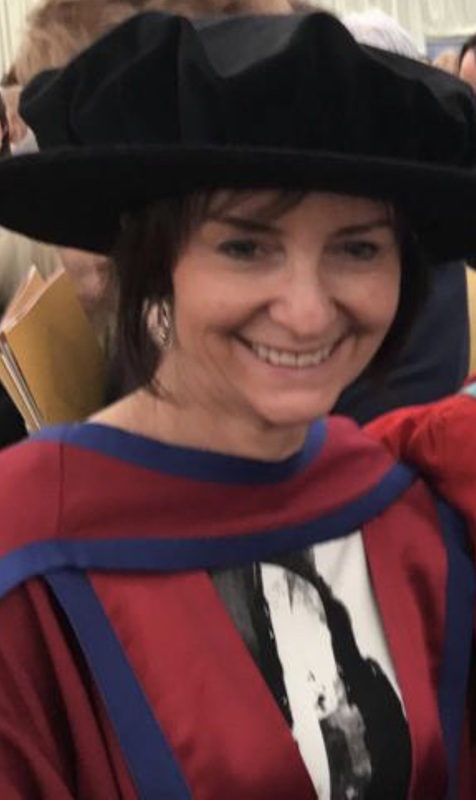 Carmela Arteaga Jorda – (Category B Supervisor): The concept of Self management and the Expert Patient Programme– Expected to finish 2018 – City University London. DNP 9009 - Doctorate in Nursing Practice - Independant Module. - Interventions to improve quality of life including reflexology and arts based interventions. Caring for people who are dying on renal wards: a retrospective study. Experiences of patients called to hospital for a renal transplant. Exploring symptoms in patients managed without dialysis: a qualitative research study. Northern Ireland Simulation and Human Factors Network Conference.